Adjustable suspension system. Chromoly construction for strength and durability. Quick release rear wheel, with alloy rim & hub, stainless steel spokes, and cartridge. The IBEX features an adjustable suspension system providing a minimum of 3" of trailer wheel travel, dramatically extending the possibilities for off-road adventures. Compatible with most full-suspension bicycles and most bicycles that have solid-axle hubs. Attaches quickly and easily to a bicycle’s rear wheel using the BOB Quick Release or BOB Nutz system. Three inches of adjustable suspension improves on- and off-road handling. Low center of gravity keeps the weight off your bicycle frame for improved handling and performance. Trailer tracks rear wheel of bicycle, making it easier to navigate narrow roads or single track. Constructed of 4130 chromoly steel tubing that’s lightweight and long-lasting. 70 lbs. carrying capacity so you don’t have to leave anything behind. Ibex 28 – for 28” wheels, 29er mountain bikes and 700c road bikes with full wrap fenders. 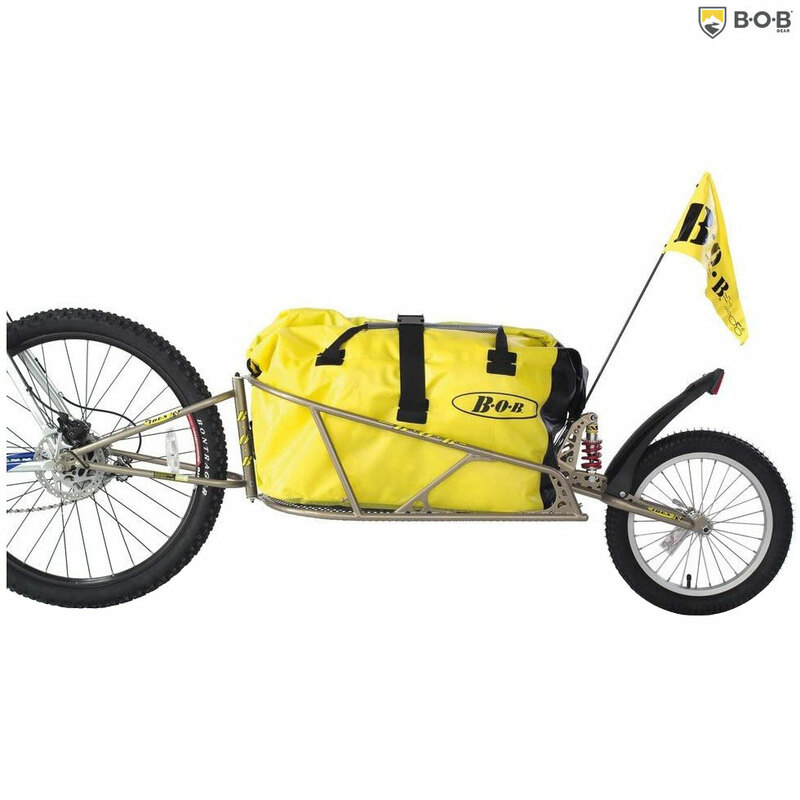 Ibex Plus – comes with a BOB Dry Sak. The wait is over: BOB Trailers are now compatible with 12mm thru-axles & fat bikes! Our friends at the Robert Axle Project have created some great gear add-ons to ensure BOB Trailers work with your bike of choice. We’ve tested each compatible axle to our stringent BOB standards, and we are confident endorsing these products for use with our Trailers. Hub: Aluminum, cartridge bearings, Quick Release. Cargo area: Roughly 25" x 16" x 18" (64cm x 41cm x 46cm). Can I confirm that this will fit 700c wheels with mudguards? The title states 26” wheels but the spec below states 28” or 700c with full mudguards. As of when this question was answered, the postage cost to Australia is £135.00. We cannot deliver to a PO box address and a signature will be required. I live in Thailand but I am visiting UK for xmas. If these are in stock I will order now. Will this fit a Thorn Nomad with A Rohloff hub? I have a Thorn Nomad that I bought from you a few years ago. I’m after a trailer. Would the Ibex fit ok? Wouk did I have to change the quick release? Yes this will fit no problem. Can This Trailer Be Attached To A Mountain Bike With 27.5 Inch Wheels? This trailer is fine for use with a MTB with 27.5 Inch wheels, however if your bike uses a bolt through axle you may need to fit one of the Robert Axle Project through axles to allow the trailer to fit to the axle. Hi, Can I Fit Bob Ibex With A Brompton? Thanks. It is possible using the solid Sturmey thread nuts that Bob produce, but as we have never tested one of these trailers with a Brompton we don't know how much the smaller wheels will affect the handling of the trailer. The standard Ibex is suitable for use with 26" wheeled bikes.